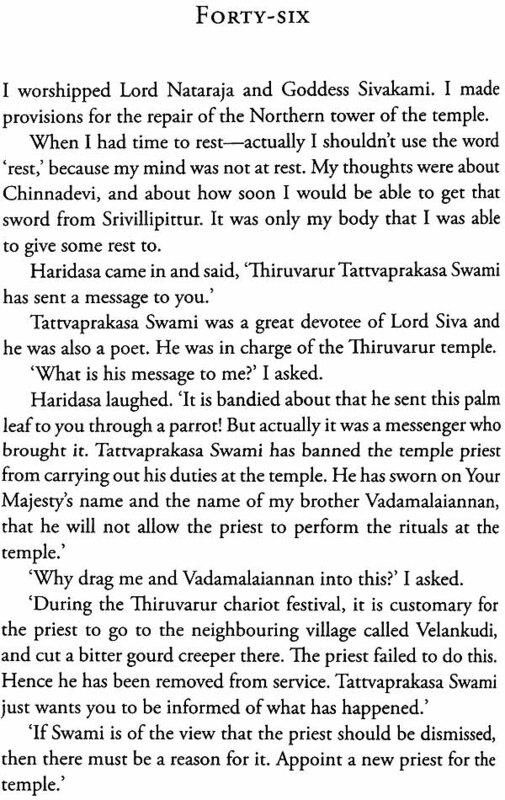 I, Krishnadevaraya is a translation of the famous Tamil novel Naan Krishnadevarayan by Ra. Ki. Rangarajan. The Tamil actor Kamal Hassan suggested that Ra. Ki. 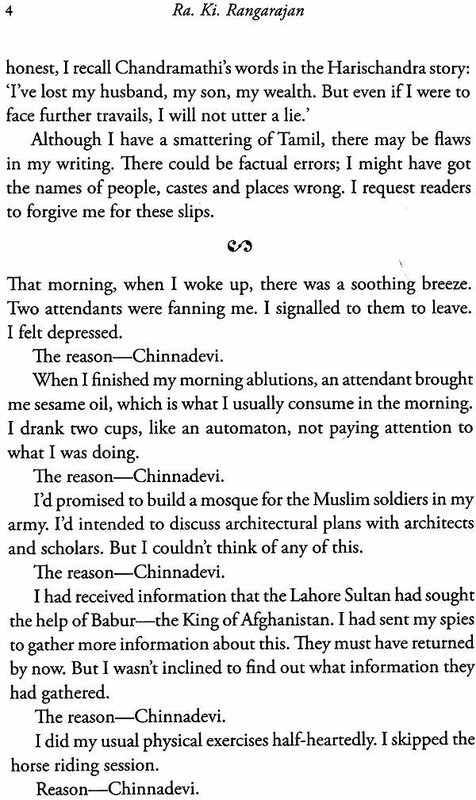 translate I, Claudius by Robert Graves into Tamil. Instead, Ra. Ki. decided to present a first-person narrative of the story of Krishnadevaraya, the emperor of Vijayanagar. Ra. Ki. 's hero is like any other young man his age-his romantic attachments overshadowing everything else in his life-until his minister and mentor, Appaji, reminds him that his duty ought to take precedence over his love life. Coming to the throne under difficult circumstances, Krishnadevaraya had to wage a relentless battle to preserve the Vijayanagar empire. Circumstances prevented him from marrying the woman he loved or pursuing literature, his true passion. Overcoming all of this, Krishnadevaraya went on to become the greatest emperor of the Vijayanagar empire. I, Krishnadevaraya takes you into the inner world of the emperor, providing a vivid picture of his thinking, his insecurities and his decision-making. Ra. Ki. Rangarajan, who was with Tamil magazine Kumudam for forty years, left a mark on almost every genre of Tamil literature. He even wrote on the occult. He was perhaps the author with the most pseudonyms-as many as ten! He also tried his hand at translations, capturing the flavour of Sidney Sheldon and Jeffrey Archer for the Tamil reading public. His translation of Henri Charriere's Papillon was serialised in Kumudam and was a huge hit. Ra. Ki's short stories with a surprise twist in the end were compiled under the tide Twist Kadaigal, and were inspired by Jeffrey Archer's A Twist in the Tale. Ra. Ki. 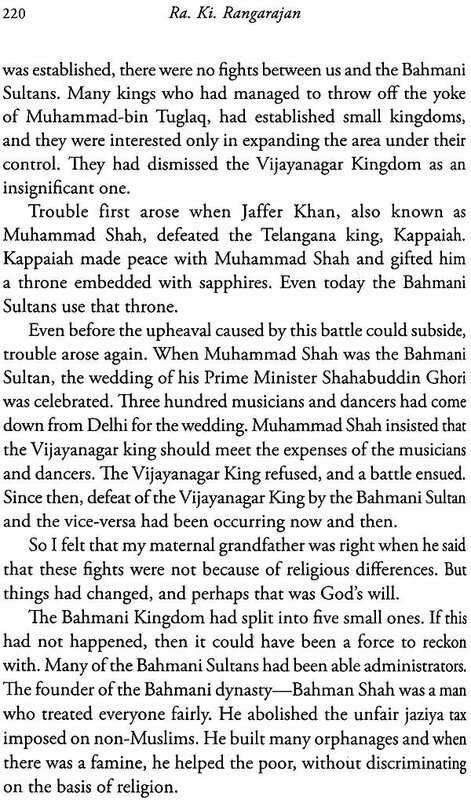 's magnum opus was Naan Krishnadevarayan. Suganthy Krishnamachari is a Chennai-based journalist, and has written articles on history, temple architecture, Sanskrit, mathematics, literature and music. She has written a series of books for schoolchildren on mathematics and English grammar. One of her short stories, published in a leading newspaper, is being used by an educational publishing company which is bringing out two English Language Teaching (ELT) series for school students. Another story was translated into Tamil some years ago, and published by an educationist in a magazine he edits. Readers expect novelty from an author. Ra. Ki. Rangarajan, who has written many books, is an author who has understood what readers want. He has now offered to his readers this story titled Naan Krishnadevarayan. Krishnadevaraya was a genius, a king who never knew defeat. His contributions to religion, culture, to the country's progress and to economic development are immense. Inscriptions referring to him bring out his greatness. Many foreigners have given glowing accounts of his reign. A bronze likeness of this king and his two queens Thirumala Devi and Chinnadevi can still be seen in the Tirumala temple. The temple towers of Hampi, Kanchipuram and Chidambaram are testimony to his contributions. Ra. Ki. has spun this story against a historical background. This story is unique, because it is in the first person. 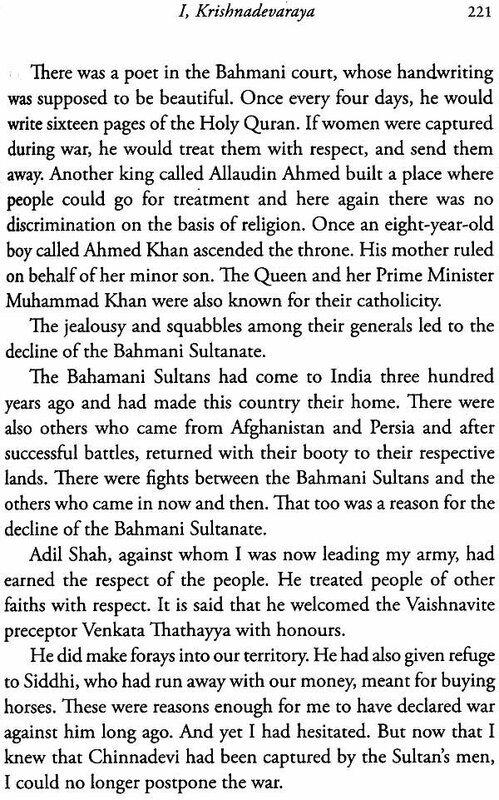 It is as if Krishnadevaraya is narrating his life story. The book is just as racy as any other well written novel with unexpected twists and turns. And yet, unlike other stories, most of the incidents in his story have some history behind them. Krishnadevaraya's period was a golden period in Indian history. There were great poets, dancers, architects attached to his court. Foreigners visited his capital. Krishnadevaraya was a man with so many achievements to his credit, that it is not easy to tell his story through a novel. And to make it appear as if the king himself is telling his story only adds to the difficulty. By writing this book, Ra. Ki. has himself created history. The practices that prevailed at that time have been portrayed authentically in the book. 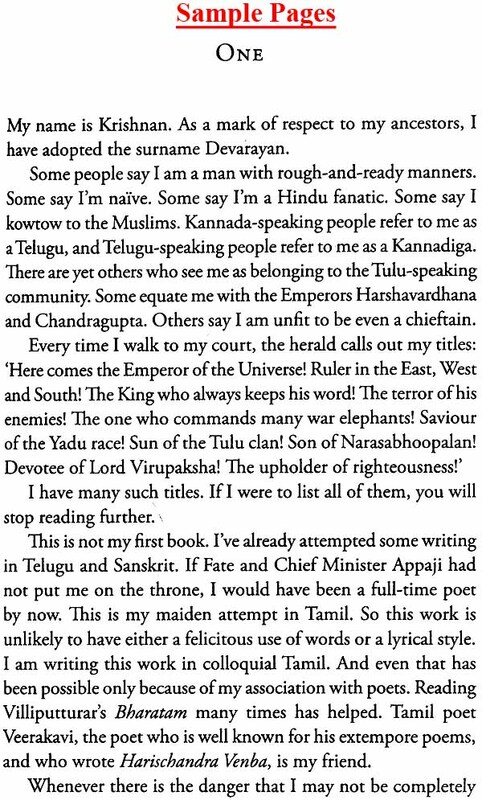 All the great men who lived in Krishnadevaraya's time find a place in this book. The roles they play in the story are in keeping with their characteristics. 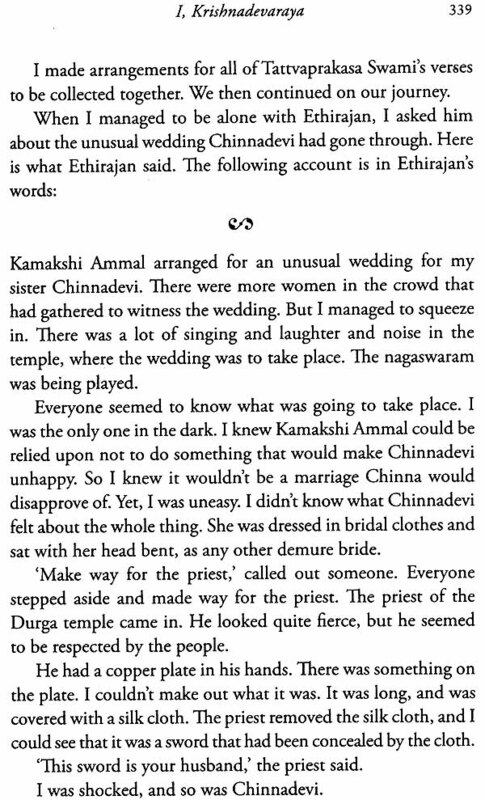 Krishnadevaraya's mother, Appaji, Tenali Ramakrishnan the list of historical characters in the book is big. With most of the characters in the story being historical ones, it is hard to describe this book as fiction. It is an account of history. And yet, unlike a history book, this book isn't bland. It wouldn't be an exaggeration to say that in future, this book will be considered the most authentic source in Tamil, for information about Krishnadevaraya. The effort the author has put in to collect information is evident from the range of information he presents. The import of Arabian horses, the introduction of paper, the coming of the Portuguese, the king's love of dance, accounts of foreigners-the book includes all these nuggets of information. Most attempts to introduce novelty in stories result in nothing more than stories that are tasteless, useless, and what's worse- harmful to society. Ra. Ki. shows us how to blend the past with the present, how to adopt a 'novel' style to present the past. This is a great service he has done to Tamil literature. I pray that Ra. Ki. will enrich Tamil literature with many more such works.